I love meeting people who have a passion for what they do. Don’t we all? Their stories of finding said passion and following it—sometimes with reckless abandon—are always inspiring. I can always find a tiny element of their story in my own, and that motivates me even more to be bolder in the pursuit of my goals. I recently spent an evening with not one, but five individuals who have found their passions in some unlikely places including chocolate, Kenya and the South End of Boston. Sofi Madison is the proprietor of Olive and Grace, the place to find the most perfect hostess gift, yummy treats for your best four-legged friend, and yourself. Sofi hand picks the products featured in her shop. And that selection process is not solely based upon taste or packaging (although they absolutely have to be quality products). 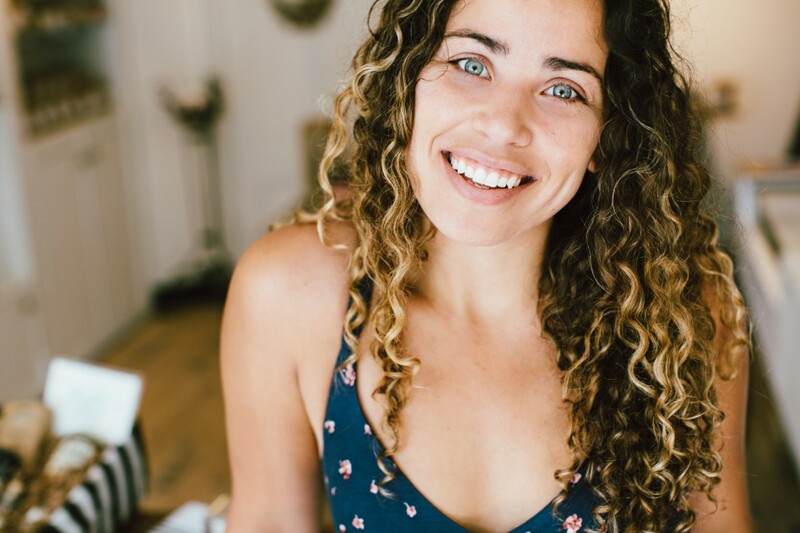 She selects items made by emerging artists, gift producers, and small batch food makers and takes their story and sustainability practices into account as well. She knows these products so well she can rattle off the history of every product and artisan featured in her shop, and if she isn’t able to tell you directly, she leaves you cute clues. 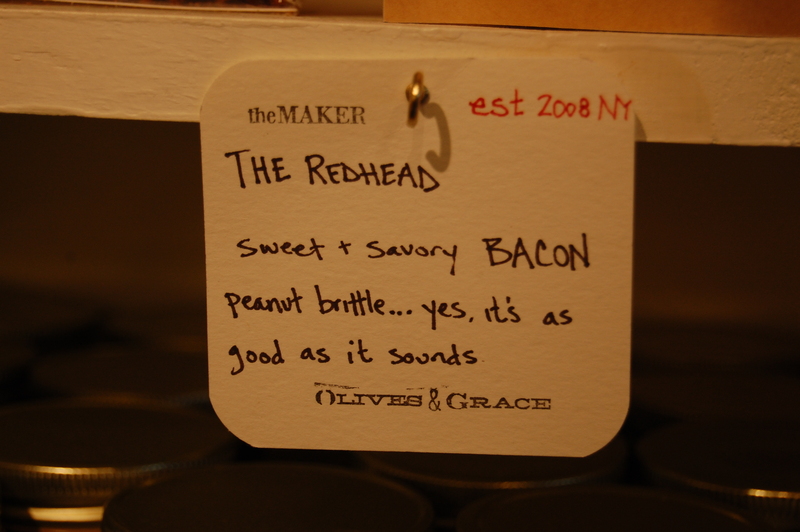 “Their back story has to match the quality of the product,” Sofi told me. The artisans’ back story serves as pieces of supporting evidence in the trial of whether or not they’ll be featured in Olive and Grace. Sofi wants folks to walk into her shop and see products they have never seen before. Sofi has a passion for selecting amazing products crafted with care and produced by passionate people. I had the privlege of meeting four of those passionate people at Olive and Grace. 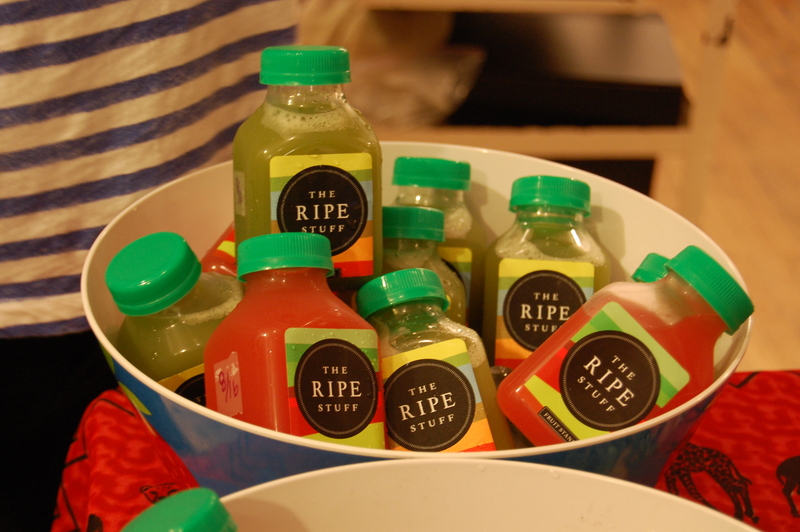 Rebecca Ferrel started her cold-pressed juice company, The Ripe Stuff, after moving to Boston and being unable to find the type of fresh juices she loved. Rebecca learned about the power of juice after a stomach illness. Her company now delivers juices A la carte and as part of juice cleans programs (she has a registered dietitian on staff) in a 20 mile radius of Boston. I am not much of a juice person, but I was pleasantly surprised by how tasty Rebecca’s juices were, even the green one! After graduation from Bowdoin (we won’t hold that against her) Sara Holby spent time in Kenya and after a visit from her mom, together they launched Ajiri tea to help provide work for the women there. 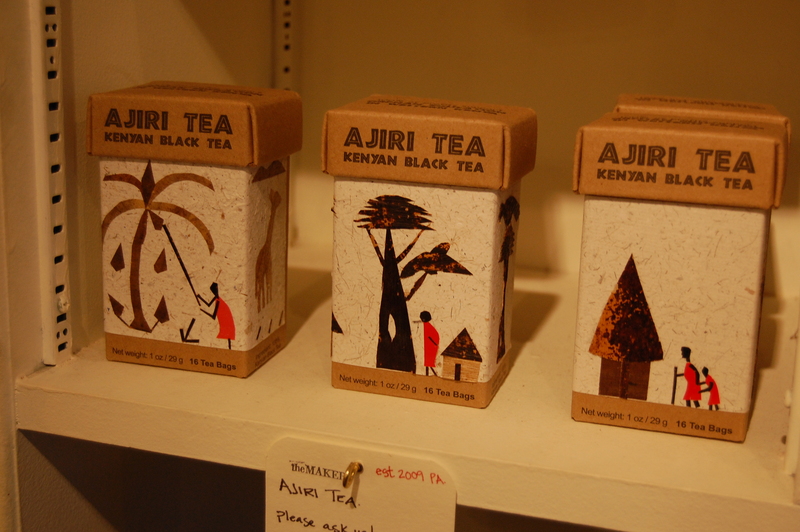 The company’s tea is produced in Kenya and now employees 63 women who make the labels. Their commitment to the community doesn’t stop there, their profits go help send 29 Kenyan children to school. And as if all that doing-good was not enough to impress you, the tea is great as well. Russ and Shari are a husband-wife chocolate making machine. They started out as a graphic designer and sculpture, respectively, but wanted to live a slower, cleaner life. That’s when Russ started experimenting, trying to make a healthy treat for his chocolate-loving wife…and Apotheker’s was born. They have since quite those day jobs, but still use those skills. For example Shari designed the honey comb pattern found on their chocolate. The three of us spoke at length about honey and bees, and my stint as a bee keeper. They are great! Their products, like a dairy-free dark chocolate are an all-natural indulgence that you don’t have to feel too guilty about. 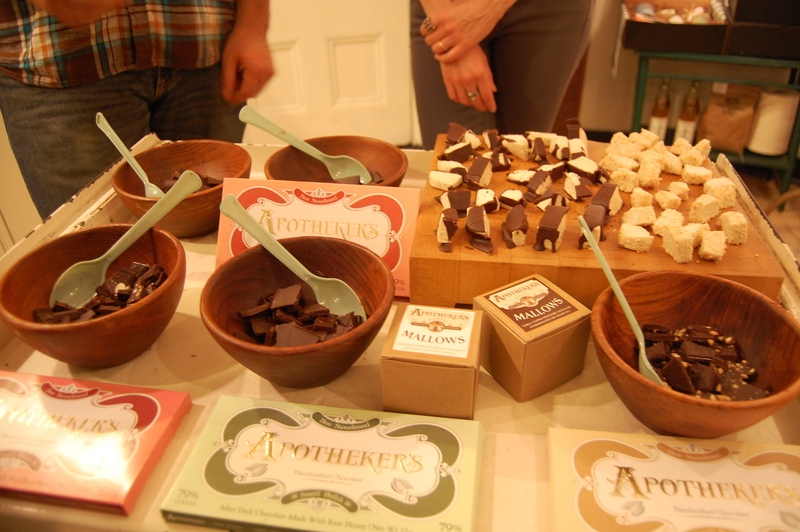 I am allergic to chocolate, but if I weren’t, I am sure I would be gushing about how tasty their treats are. Meeting all of these talented and passionate individuals, and hearing their story, really made me think about what I buy and put in my mouth. The Jolly Green Giant doesn’t exactly take the time to explain to me how he hand-selects the broccoli sitting on my plate. So instead of my favorite food of all time, Skippy Super Crunchy Peanut Butter, I picked up some all natural butter; half peanut, half almond, from a North Carolina-based company. 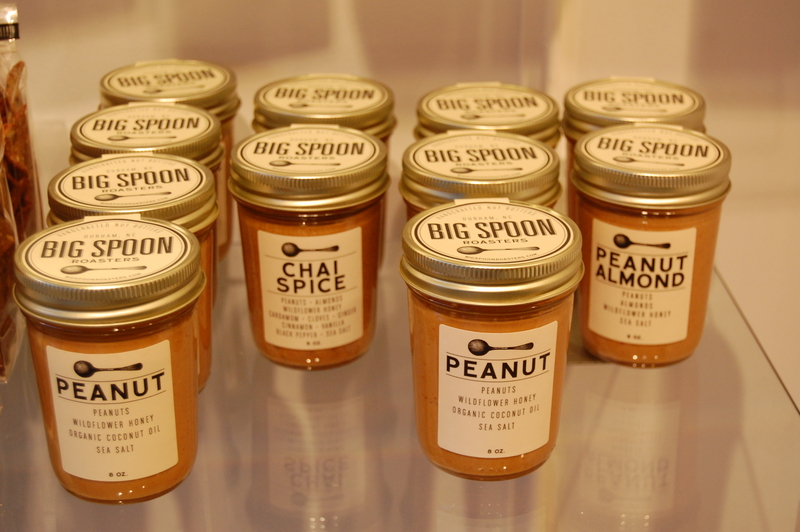 I not only learned that the owner (a fellow peanut butter nut since childhood) started making nut butter while in the Peace Corps in Zimbabwe, but also that he named his company after his father’s nickname “Big Spoon.” That made it taste ever sweeter.